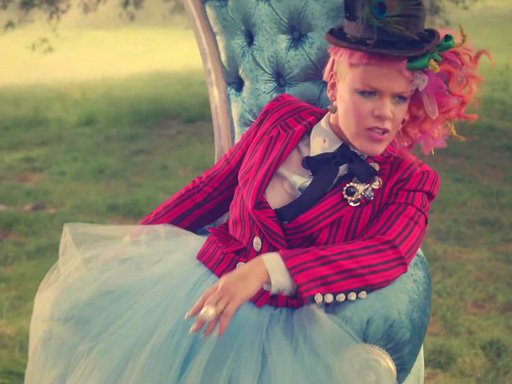 The Randy Report: New Music Video: Pink "Just Like Fire"
New Music Video: Pink "Just Like Fire"
Pink drops her new song "Just Like Fire" from the soundtrack of the upcoming Alice Through the Looking Glass, and it's a high-flying, visually vibrant tea party. The artist displays her impressive aerial silk skills, plays a riveting game of human chess and drinks tea with the Mad Hatter, all while singing about the importance of loving and accepting one’s self fully, even if others think you’re mad. In typical Pink fashion, the video is energetic and thrilling, especially when her husband, played by real life hubby Carey Hart, decides it’s time to send her off to an institution after her own special trip through the looking glass.